The mineral calcite consists of calcium carbonate CaCO3. It is a very common mineral that makes up limestone. Beginning students in geology labs quickly learn that calcite can be easily identified because it fizzes in weak hydrochloric acid. 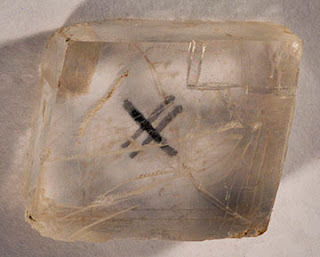 Also, if the crystal of calcite is clear (transparent), any writing underneath of it is "doubled" when viewed. This effect is shown in the first two images below. The first image is of a small, clear crystal, about 3 cm across. It is sitting on a white piece of paper, with the letter "X" written on it. Light is refracted through the crystal and produces the "doubling" effect (called double refraction). Single perfect crystals like this one, have what is known as the rhombohedron shape (a six-sided prism). The second image is of a longer (7.5 cm) clear rhombohedron crystal, sitting on a white piece of paper with the word "calcite" written on it. There are also other colored varieties of calcite, as shown in the following "color wheel." For scale, the green crystal is 4 cm length. These varieties, which I had available, show a range in color of calcite, from orange, red-orange, red, yellow-brown, clear, light yellow, blue, green, and (in the center) honey color. There are other intermediate colors. Impurities in the crystals cause the different colors. The "black looking" crystal at the bottom of this "color wheel" is actually a clear crystal, and the black background used in making the photo shows through this clear crystal. A last picture, shown below, is of a stalactite of calcite from the ceiling of a cave. The calcite crystals formed by dissolving out of underground water and dripping into an open space (a cave). The structure is 5 cm in height.